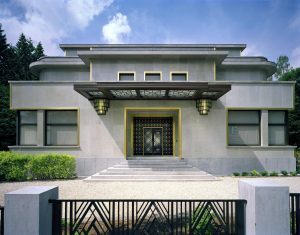 A jewel of Brussels’ Art Deco architectural heritage is the famous Villa Empain. Now is one of the best moments to visit as it recently opened an immersive exhibition, ‘Flamboyant Art de vivre in the Thirties’, inviting visitors to enter into the home of a fictional collector from the 1930s. The current owner of the villa is the Boghossian Foundation, created in 1992 by Robert Boghossian and his two sons with a mission to promote cultural ties between the East and the West. It was Baron Empain who commissioned Swiss architect Michel Polak to erect the villa in 1930. After its acquisition in 2006, the Foundation started renovating the villa, a complicated process that lasted until 2010. It has since become an emblematic figure of the Art Deco architecture in Brussels. Louma Salamé, curator of the exhibition, has chosen as the starting point of the show the construction years of the villa. 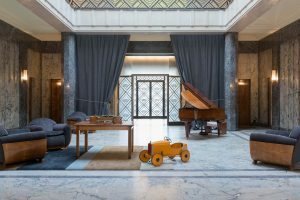 The works of a group of artists, architects, designers, craftsmen and musicians who were all active during this fascinating interwar period are displayed throughout the entire house. The result is that the villa is shown entirely furnished in the Art Deco style with a selection of paintings, sculptures and furniture all from that period. Most of the pieces are owned by private collectors. Belgian artists featured in the exhibition include Akarova, Marcel-Louis Baugniet, Geo De Vlamynck, Marthe Donas, Victor Servranckx, Rodolphe Strebelle, Edgard Tytgat and Henry van de Velde. 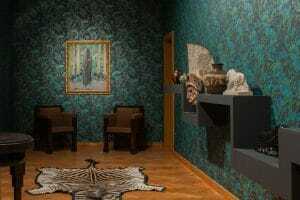 One of the featured rooms is the ‘Smoking Room Oasis’. It is arranged as a cabinet of curiosities bringing together African masks, statues and furniture, as well as statuettes and vases including two pieces created by the well-known Charles Catteau. The room also features a painting by Dutch artist Kees Van Dongen, ‘Femme debout dans le jardin‘, inspired by the artist’s trip to Egypt. At that time, there was a high interest in Egyptian history and this is reflected in some of the exhibited pieces. Readers interested in Egypt will be delighted to know that the Foundation is also currently showing on the lower floor of the villa another exhibition entirely devoted to Héliopolis, which was also close to Edouard Empain’s heart. 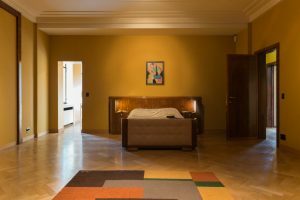 Another displayed room is a bedroom dedicated to the birth of Abstraction in Europe which includes ‘Berührung‘, the emblematic work of painter Wassily Kandinsky. The rug, made up of straight lines, shown on the image below was designed by Marcel-Louis Baugniet. The image also shows a painting by Belgian female artist Marthe Donas entitled ‘Composition abstraite‘. During the 1920s, Marthe Donas produced many paintings, glasses and collages under the male pseudonym Tour Donas. The Foundation is proposing a full cultural programme including lectures, concerts, guided tours and even dance classes. The beautiful café of the Villa has also been reopened in collaboration with TERO and it is highly advisable to book in advance. ‘Flamboyant Art de vivre in the Thirties’ is running at Villa Empain until 24 August 2019.